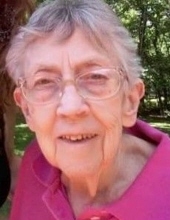 On Sept. 7, 2017, Betty D. McGrath, 86, of East Moline, passed away peacefully at her home. Quad Cities Cremation Center is assisting the family with arrangements. Betty was born June 6, 1931, in Burlington, Iowa, the daughter of Louis and Verna Higdon. She married John F. McGrath on Jan. 19, 1951, in Burlington. She served in many ministries for more than 40 years at Crossroads Assemblies of God in East Moline. She is survived by her husband of 66 years, John F. McGrath; children, Rita McGrath, Kristen Abdiel, Johnny McGrath and Teeocka Sylvester (adopted granddaughter); eight grandchildren; 14 great- grandchildren; two sisters; and four brothers. To plant a tree in memory of Betty D McGrath, please visit our Tribute Store. "Email Address" would like to share the life celebration of Betty D McGrath. Click on the "link" to go to share a favorite memory or leave a condolence message for the family.